As many customers do ask, here's a little "potted history" with apologies to better historians than me for all the bits I've undoubtedly got wrong . . . The MacDonald clan is often described as Scotland's oldest and most famous clan and probably with good reason, although this immediately raises the discussion about what is a "clan" as opposed to a tribe or other extended family-based community. The name derives from "Donald of Islay", whose father was Somerled, the King of the Isles and Lord of Argyll. When Donald died around 1269 he was succeded by the famous Angus Og who fought alongside King Alexander III against the King of Norway and helped win back the Hebrides for Scotland. Angus's son (also Angus) fought alongside King Robert the Bruce with the clan at the Battle of Bannockburn in 1314 and had sheltered the Bruce in the years before this. 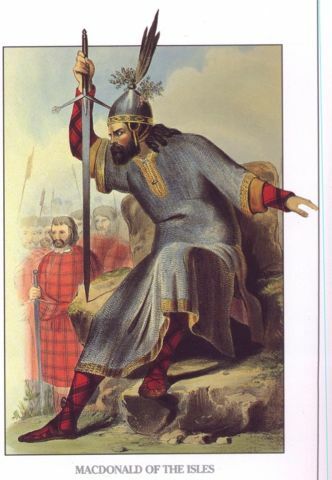 In recognition of Clan Donald's support Robert the Bruce proclaimed that Clan Donald would always occupy the honoured position on the right wing of the Scottish army and rewarded Angus with grants of land in the West Highlands and continued to rule the Western Isles as a separate principality. The "Lords of the Isles" as the MacDonald chieftans became known, afforded them massive influence and wealth... after all, in those days most trade moved around Scotland by sea, not by road, so their strategic strongholds virtually controlled Scotland's sea-routes and domestic trade, aswell as trade with Ireland, England and Scandinavia. The importance of the sea can be seen with the ships in the clan's coat of arms and in the MacDonald of MacDonald clan motto "per mare per terras" meaning "by sea and by land"... very similar to the motto of the present-day Royal Marines. The MacDonalds of Clanranald and MacDonalds of Sleat share the motto "My hope is constant in Thee". So powerful was the Lordship of the Isles, that it had its own parliament at Finlaggan in the Isle of Islay and even threatened the throne of Scotand itself. John (10th Lord of the Isles) played a dirty trick on King James IV of Scotland by signing a treaty with King Henry VI of England; this treaty promised John even more lands if and when King James was defeated. However, James got wind of the plan and invaded the Isles in 1463 (1493?) and stripped John of his titles... bad move, John! The clan split into various branches which evolved under their own chieftains. The main branches were Clan Donald of Sleat (Skye), Clanranald (Moidart, Glengarry, Lochaber and Glencoe) - the Glengarry line adopting the spelling MacDonnell. The MacDonells of Keppoch had their lands on the mainland in Lochaber; they were sometimes known as Clan Ranald of Lochaber. The last clan battle in the Highlands took place between MacDonell of Keppoch and MacKintosh of MacKintosh in Lochaber in 1688. This dividing and sub-dividing of the clan is the reason why MacDonald remains Scotland's larget clan, by name. One of the most famous groups were the MacDonalds of Glencoe, who were massacred by British Government troops (blamed on the Campbells, but in fact more due to poltitical shenanigans). 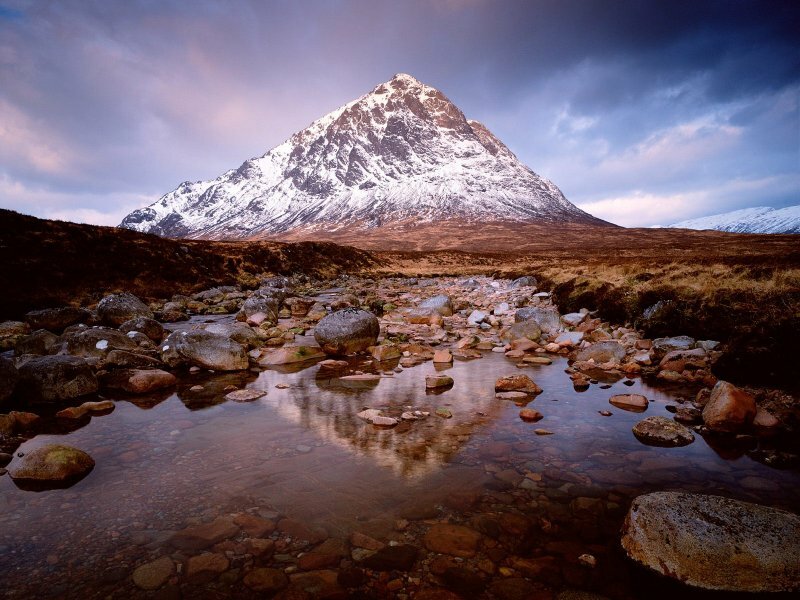 Glencoe is an important pass, winding its way through stunning mountains from Rannoch Moor to Loch Linnhe and the all-important sea routes in the West. 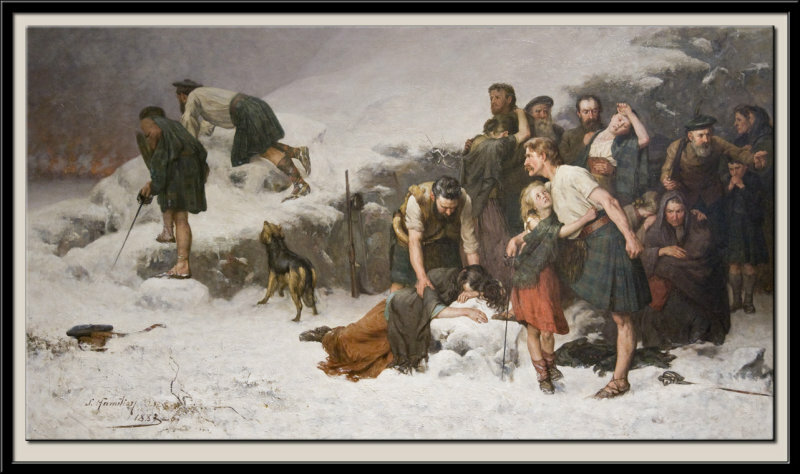 The massacre took place in the early morning of 13th February 1692 and began simultaneously in three settlements along the glen: Invercoe, Inverrigan, and Achacon, although the killing took place all over the glen as fleeing MacDonalds were pursued. Thirty-eight MacDonalds were killed by the troops who had accepted their hospitality, on the grounds that the MacDonalds had not been prompt in pledging allegiance to the new British king, William of Orange. Anyone looking at the history realises this is a nonsense. Alistair MacIain (12th chief of the clan) arrived at Fort William and reported to the governor of the garrison town, a Colonel Hill. Colonel Hill claimed that he was not authorized to receive the necessary oath and instructed MacIain to proceed quickly to Inveraray to make his oath before Sir Colin Campbell, the sheriff of Argyll. Colonel Hill gave MacIain a letter of protection and a letter to Sir Colin asking that he receive MacIain's oath since MacIain had come to Colonel Hill within the allotted time. Colonel Hill also reassured MacIain that no action would be taken against him without his having the opportunity to make his case before the King or the King's privy council. It took MacIain three days to reach Inveraray, partly due to winter weather, partly due to his old age and partly due to being detained for a day at Balcardine Castle by the 1st company of the Earl of Argyll's Regiment of Foot, at the command of a Captain Drummond (a Campbell! ), thus ensuring his late arrival at Ineraray. On arrival at Inveraray, he was forced to wait for three days for the arrival of Sir Colin who was absent, spending the New Year with his family. Upon his return, Sir Colin (another Campbell!) reluctantly accepted MacIain's oath. MacIain was reassured he had satisfied the spirit of the required oath, and therefore did not anticipate any action against himself or his people. However some elements within the government saw this episode as an opportunity to use his failure to fulfill the letter of the requirement (by missing the deadline) to make an example of the MacDonalds. The Campbells, it has to be said, also seemed to relish the opportunity to create a situation where they could exact revenge on the MacDonalds with complete impunity. As well as the thirty-eight people killed by troops, at least another another forty, including children, died of exposure on the exposed mountains. The massacre backfired on the British government as it helped kindle Jacobite support, eventually leading to the uprisings of 1715 and 1745. To this day MacDonalds and Campbells are rarely the best of friends and their involvement in the massacre certainly won them few friends in that part of the world. In fact, the Clachaig Inn, a small hotel at the head of Glencoe has a sign on the door which reads "No Hawkers, or Cambells". Folks have long memories in these parts! The MacDonalds supported Bonnie Prince Charle during the 1745 Jacobite uprising and fought on the right hand wing of the army, just as King Robert the Bruce had decreed, at the battle of Culloden in 1746. Clan MacDonald of Sleat did not take any part in the uprisings, so their possessions remained intact. The glen's Eastern end stands the "Great Shepherd of the Glen" - Buachaille Etive Mor - guarding the gateway to this most ancient of routes through the Western highlands. 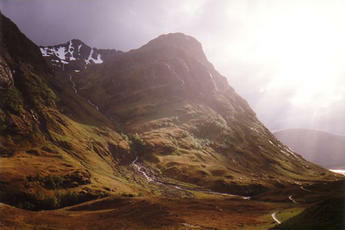 The glen is a beautiful, haunting place, with high brooding mountains rising steeply on either side of the narrow road. There are countless recorded instances of supernatural experience and there is a real sense of sadness in the place... perhaps because of the geography, perhaps the history, perhaps both; but one can easily see why highlanders also call it the "Valley of Weeping". Because the clan was spread far and wide through Scotland and Northern Ireland, a substantial number of modern surname sects exists, including . . . Alexander, Beath, Beaton, Bethune, Bowie, Colson, Connall, Connell, Cram, Crum, Danalds, Darroch, Donald, Donaldson, Donillson, Donnelson, Drain, Galbraith, Gilbride, Gorrie, Gowan, Gowrie, Hawthorn, Hewison, Houstoun, Howison, Hughson, Hutcheonson, Hutchinson, Hutchison, Isles, Kellie, Kelly, Kinnell, Mac a' Challies, MacBride, MacBryde, MacCaishe, MacCall, MacCash, MacCeallaich, MacCodrum, MacColl, MacConnell, MacCook, MacCooish, MacCrain, MacCuag, MacCuish, MacCuitein, MacCutcheon, MacDaniell, Macdrain, MacEachern, MacElfrish, MacElheran, MacGorrie, MacGorry, MacGoun, MacGowan, MacGown, MacHugh, MacHutchen, MacHutcheon, MacIan, Macilreach, Macilriach, Macilleriach, Macilrevie, Macilvride, Macilwraith, MacKean, MacKellachie, MacKellaig, MacKelloch, MacKiggan, MacKinnell, MacLairish, MacLardie, MacLardy, MacLarty, MacLaverty, MacLeverty, MacMurchie, MacMurdo, MacMurdoch, MacO'Shannaig, MacQuistan, MacQuisten, MacRaith, MacRorie, MacRory, MacRuer, MacRurie, MacShannachan, MacSorley, MacSporran, MacSwan, MacWhannell, Martin, May, McReyolds, McRuer, Murchie, Murchison, Murdoch, Murdoson, O'Drain, O'May, O'Shannachan, O'Shaig, O'Shannaig, Patton, Purcell, Revie, Reoch, Riach, Rorison, Shannon, Sorley, Sporran, Train, Whannel, Wilkie, Wilkinson, Wilkins and (believe it or not) many, many others. Untl fairly recently many the various MacDonald sects were regarded as separate clans. This particular tartan is MacDonald of Clanranald... John, the 7th Lord of the Isles, passed substantial lands to his son Ranald and through this line developed the Clan Ranald. Hundreds of years later, in 1745, Ranald the 17th led his clan out in support of Bonnie Prince Charlie and after the defeat at Culloden was forced to feel with his Prince to France. He returned to Scotland in 1754 and his line of succession continued until 1944 when the chieftanship passed to the heirs of Alexander of Boisdale. Click here to buy MacDonald tartan ribbon.